Betty Barker Hodges died peacefully at Windemere Rehabilitation and Nursing Center on Feb. 15, 2019, in Oak Bluffs. A private service was held for family on Saturday, Feb. 16, 2019. Betty was born June 26, 1927, in Five Points, Pa., the youngest of three children of Francis Willard and Effie Barker. She grew up on the family farm, where she played, helped with the chores, and learned to drive the tractor. While still a child, the family home burned to the ground, and she fondly remembered setting up a temporary home in the horse stable. They lived a rich life on the land even through the Depression years. 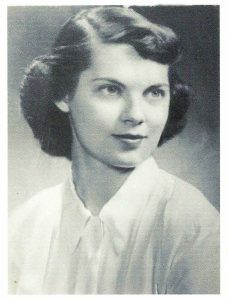 Betty attended Westtown School in West Chester, Pa. She graduated from Earlham College, a Quaker school in Indiana, with a major in food service. She also trained as a dietician at the University of Michigan Hospital in Ann Arbor. During this time her brothers, Warren and Larry, served in WWII even though their Quaker beliefs encouraged pacifism. While at the University of Michigan, Betty met Sander Tonnesen in the summer of 1950, and they married in July 1952. Sander’s work for the DuPont Co. in Wilmington, Del., resulted in many moves for the family, including a four-year stay in Geneva, Switzerland. Moving back to the States in the late ’60s, Betty became active in the church while raising four children in Wilmington. Betty was a very spiritual person and focused on helping many people navigate life’s difficulties. She worked in the health food community, was passionate about sharing her knowledge of nutrition, and was an early adopter of healthy living. She loved to experiment with cooking using ingredients like carob, and alternatives to wheat and sugar resulting in her healthier version of brownies — no chocolate, no sugar, and no wheat. Through her ministry she met Larry Hodges, whom she married, and continued with her spiritual calling to serve throughout the U.S. and as far away as Kenya. After Larry died, Betty returned to Pennsylvania, and later decided to move to Martha’s Vineyard to be close to her children and their families living on the Island and in Boston. She loved living on the Vineyard, and enjoyed the Island’s beauty and the making of new friends. In 2015 she moved into Windemere, where she received loving support from staff and family, becoming known as a beacon of positivity and the Queen of Bingo. Betty is survived by her four children, Keren Tonnesen of Oak Bluffs, David Tonnesen and his wife Pamela Su of Honolulu, Hawaii, Mark and Breeze Tonnesen of Vineyard Haven, and Tim Tonnesen of Los Angeles, Calif. Betty had four grandchildren, Jeffrey Tonnesen and Erik Tonnesen of Brooklyn, N.Y., Dwi Upole and her husband Jeremy of Hockessin, Del., and Quinn Savard and her husband Stephen of Vineyard Haven. Betty was also blessed with five great-grandchildren. She is also survived by her niece, Ellen Geisel, and her husband Randy, nephews Keith Barker and his family, and Richard Barker and his wife Sue, and niece Beverly Barker. In lieu of flowers, anyone wishing to honor Betty’s memory, please consider making a donation to Hospice of Martha’s Vineyard, at hospiceofmv.org/donations. The post Betty Barker Hodges appeared first on The Martha’s Vineyard Times.